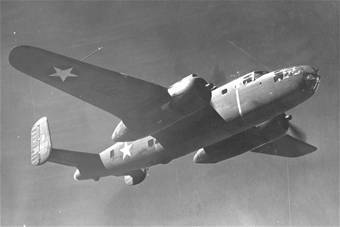 On September 22, 1942, a flight of B-25 Mitchel bombers left Presque Isle Army Air Field bound for overseas duty. Shortly after take off the planes were recalled to the base due to poor weather/visibility conditions. One of the planes, (41-13049), crashed in a wooded area about six miles west of Perham Village, Maine, and exploded. Local residents stated the blast was heard for miles around, and the site was marked by a large crater. The tail section was discovered about a quarter of a mile away, which would seem to indicate a structural failure with the aircraft. Two Nazi sympathizers were later arrested for tampering with an aircraft at Presque Isle leading to speculation that the B-25 had gone down due to sabotage. The B-25 was attached to the 310th Bomb Group, 379th Bomb Squadron, then based in Greenville, South Carolina. All seven crew members were killed. Pilot: 2lt. John F. Watson Entered service from New York, (O-790435) Burial location unknown. Co-Pilot: 2lt. John W. Rieves Jr. , 22. He’s buried in Asbury Cemetery, McKenney, Virginia. For a photo of his grave go to www.findagrave.com and see memorial #138056088. S/Sgt. John S. Delano He’s buried in Arlington National Cemetery. S/Sgt. James A. Kviz Burial location unknown. S/Sgt. Eugene J. Crozier He’s buried in Arlington National Cemetery. S/Sgt. Frederick W. Rowbottom, 23. He’s buried in Calvary Cemetery in Virginia, Minnesota. For a photo of his grave go to www.findagrave.com and see memorial #123323580. S/Sgt. Richard K. Riddle, 27. He’s buried in Oak Grove Cemetery in Delaware, Ohio. For a photo of his grave go to www.findagrave.com memorial#47394120. Later in the day another B-25 (41-13098) belonging to the 379th Bomb Squadron took off from Presque Isle also bound for overseas duty, but it crashed shortly after take off in the neighboring town of Fort Fairfield, Maine. For more information, see Fort Fairfield, ME – September 22, 1942 under “Maine Military Aviation Accidents” on this website.